You guys know how much I love a good bargain especially when it comes to makeup, so imagine my sheer glee when I came across this post from Jane regarding a new make up brand called Makeup Revolution London. I checked out their site immediately and was blown away by the range of products as well as price! A foundation in darker shades for £4.00 which is a low end dupe of a Giorgio Armani foundation? Lipsticks in all colours for £1? Eyeshadow palettes which are near dupes for the Nakes palettes for £4.00? I HAD to check this out! Now, when it comes to prices as low as the above for make up it is easy to instantly think you’re going to get something unimpressive (think back to the MUA matte lipsticks,) however I wanted to give Makeup Revolution a chance, especially after seeing swatches from other beauty bloggers. 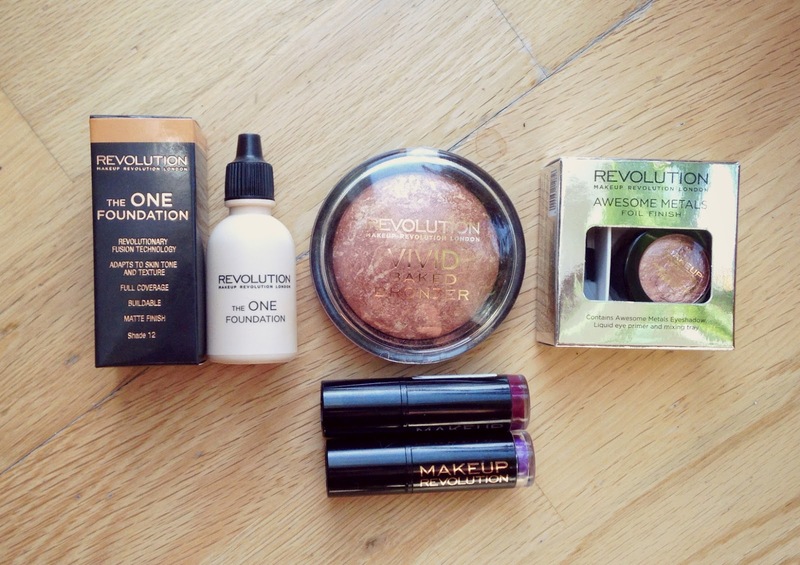 I was lucky enough to receive a few products from the Makeup Revolutions team to try out. The One Foundation in Shade 12: This foundation is available in 16 shades, (winning!) unfortunately, I chose the wrong shade. Jane from BBB suggests that these shades work in close correlation with the Illamasqua shade system, I’ll pick up Shade 15 next time. I have, however, tested out Shade 12 in regards to texture and finish. The foundation itself is very lightweight and silky and dries to a semi matte finish, I can’t say I have ever encountered a foundation with this texture before. Not one for high coverage but amazing for those of you who want a more natural flawless look to your skin. I do not own any Giorgio Armani foundations so I cannot say whether it is an exact dupe for Maestro but from all the talk going around the beauty blogsphere, it seems the texture and finish are very similar! Amazing Lipstick in Depraved: Now I’m going to be completely honest here, I was not expecting big things from the MR lipsticks. From the swatches I had seen most of the colours showed up patchy, almost drying. So when I swatched Depraved I was pleasantly surprised. The lipstick texture is very creamy and so easy to apply. The colour itself is a gorgeous powder violet, which I found wasn’t too ashy on my complexion at all! Colour pay off wise, yeah you’d need more than one layer but I always go in with 2 or 3 anyway depending on how I feel. For maximum colour payoff, 3 applications is all that’s needed, maybe even two if you blotted your lips first time round. A great lipstick for summer and spring! Vamp Collection Lipstick in Rebel With Cause: I love a deep berry lip so this was a nice addition to my deep berry collection! Again, this lipstick is creamy and very easy to apply, on first swipe you do get great colour pay off, but due to its texture (almost slightly gel like) you’d probably need another coat for longevity. Both lipsticks retail for £1.00 each which is mind blowing to me, it really is! If I had to fault anything about the lipsticks, it would be the lids, they are not secure AT ALL. Hopefully this will be something MR improve in future, otherwise I am a big fan and I will be picking up more of these lippies. For swatches of both lipsticks, please click HERE. Awesome Metal Eye Foils in Magnificent Copper: I had previously seen Stila bring out a product which had a similar concept but a much higher price tag, I wanted to try it out but I couldn’t bring myself to pay that amount for one eyeshadow so when I saw the Awesome Metal Eye Foils, I knew I had to try this out! The Metal Eye Foils come with the product itself, a liquid primer and a small metal tray. You’re then required to mix the primer and product together in the tray and apply for long wearing metallic look. The texture of the Eye Foil itself is not what I thought it would be, it is in fact a cream based product. 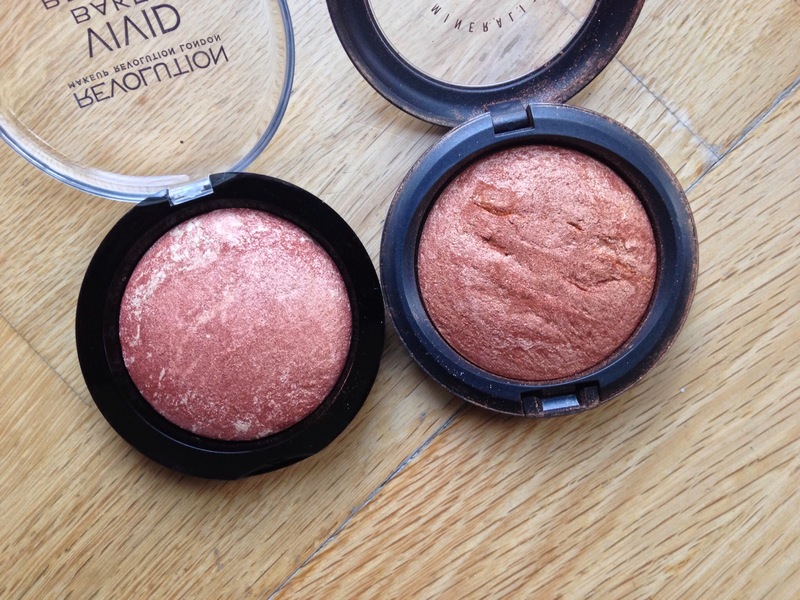 Magnificent Copper is a ridiculously pigmented cream eyeshadow which shows up so well on my skin tone. I have used it with and without the primer, I found the product harder to work with (less pigmentation) when using the primer but this could possibly be down to me using it incorrectly. I will be working with it again for a look so I’ll be able to give more information the entire process! Vivid Baked Bronzer in Rock On World: Possibly my favourite of the bunch! I wouldn’t call this a bronzer for my skin tone but that’s not a problem, for me it’s a perfect highlighter! 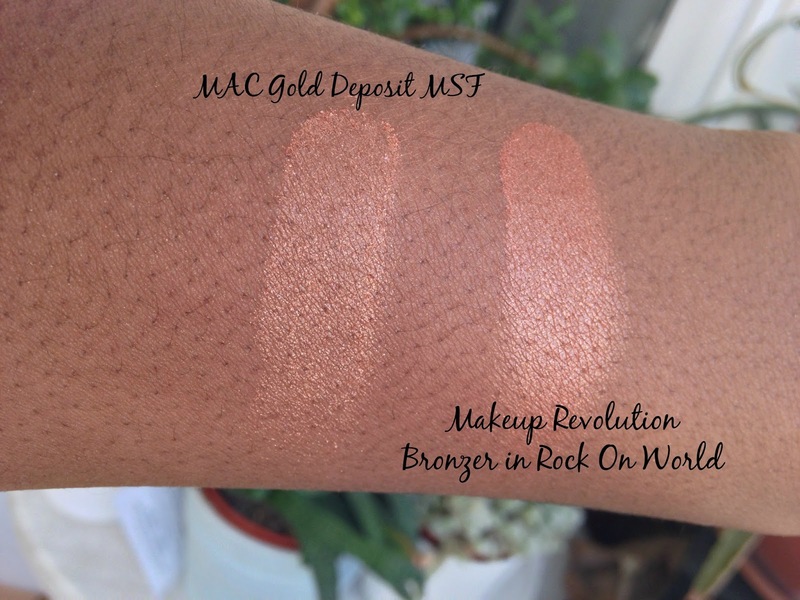 Now, many of you may know how much I love my MAC MSF Gold Deposit, it is PERFECT for my skin tone and offers the right amount of glow but at £22.00 it may not be purse friendly for all. For £4.00 you get an amazing dupe! In this picture you can see Rock on World is slightly more red toned compared to Gold Deposit but upon swatching there really isn’t that much difference! I find that MR Rock on World is much more pigmented and buttery compared to Gold Deposit, this also makes it easier to apply and blend. It is a tad bit darker than Gold Deposit but this doesn’t make a dramatic amount of difference when applied as you can see below. I’ve applied the bronzer lightly over my lids, down the center of my face and on the highest points of my cheeks and well as my brow bone. It gives the most gorgeous effect! 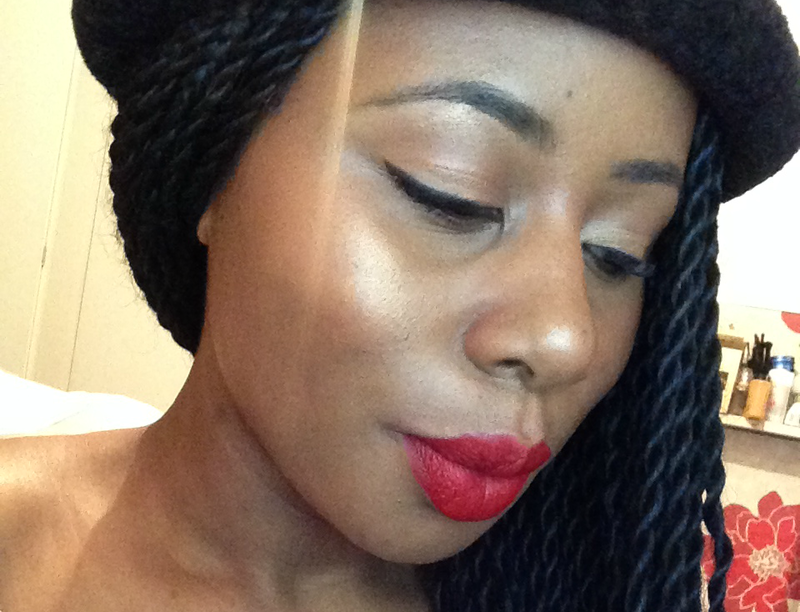 All in all I am overly, and I mean OVERLY, impressed with the quality of Makeup Revolution products! I am looking to add more than a few more products to my collection, I have my eye on their blushes, lip lacquers and of course eyeshadow palettes next! Do you have any Makeup Revolution products? Their products are very impressive for the price, I'm not disappointed at all! I have never heard of REVOLUTION until now, looks amazing and perfect dupes for MAC! Would appreciate it so much if you could follow me via google friend connect as a member of my blog! Thanks Katie, I've taken a look! Not heard of this brand before, definitely need to look into it! Would definitely recommend it Katie, especially for the price! Je suis très impressionné avec eux! Oh my gosh Esther, it is stunning! I would recommend it to all WoC! I purchased some of the items and the bronzer is absolutely to die for !! It is also gorgeous on woc. Great post !! The bronzer is amazing, I used this more than my MAC MSF now!